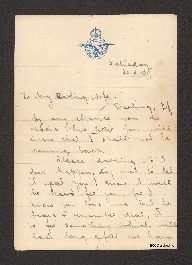 Letter from Sergeant Edward Milling to his wife to be sent in the event of his death. Edward urges his wife to remain strong in the face of adversity, remembers the happy time they had together, and expresses his love and devotion for her and their daughter. He also mentions his parents and his friend John. Darling. If by any chance you do receive this letter you will know that I shall not be coming back. all left this earth, so please be brave dear. Remember darling, you have our little girl [deleted] K [/deleted] now to think of; and she is worth all the love which you have for me, so look after her & love her for me dear. you darling more than anything in this world. My one regret at leaving is that I am leaving behind the dearest wife who ever lived, & the mother of my darling little girl. world. I must ask you again dear to love & take care of our little girl. Bring her up to be everything that you are, & you will have a daughter to be proud of. they are the finest parents a man could have, & I only hope that I go worthy of the love & devotion they have given me. Tell John to take care of himself & I think he is the finest brother & [underlined] pal [/underlined] anyone could have. He is a grand lad & I wish him all the [deleted] indecipherable word [/deleted] luck in the world. Good bye darling & until we meet again all my love forever. Edward Milling, “Letter to his wife from Edward Milling,” IBCC Digital Archive, accessed April 24, 2019, https://ibccdigitalarchive.lincoln.ac.uk/omeka/collections/document/1182.